Just Manufacturing is pleased to announce the expansion of its healthcare products line with the addition of sinks, hand wash stations and fixtures made with CuVerro® Antimicrobial Copper Surfaces. One of the most frustrating problems professionals in Infection Control and Epidemiology face is how to prevent hospital-acquired infections. More public and health care environments supplement current infection and disease control practices with antimicrobial copper, antibacterial products, hospital sinks, hand wash sinks and scrub sinks. 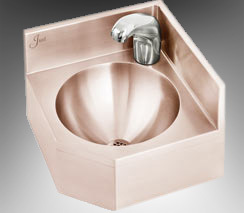 Antimicrobial Hand Wash Copper Sinks made with CuVerro® Antimicrobial Copper Surfaces. EPA-registered CuVerro surfaces begin killing pathogens* on contact, killing 99.9% within two hours, and keep on killing 24/7. Just Manufacturing is pleased to announce the expansion of its healthcare products line with the addition of sinks, hand wash stations and fixtures made with CuVerro® Antimicrobial Copper Surfaces. One of the most frustrating problems professionals in Infection Control and Epidemiology face is how to prevent hospital-acquired infections. More public and health care environments supplement current infection and disease control practices with antimicrobial copper, antibacterial products, hospital sinks, hand wash sinks and scrub sinks. CuVerro® Antimicrobial Copper Nickel surfaces are attractive, safe to use and never wear or wash away. Copper is the only active, bacteria-killing ingredient in CuVerro alloys. EPA-registered CuVerro surfaces, begin killing pathogens* on contact, killing 99.9% within two hours, and keep on killing 24/7. Just Manufacturing healthcare products made with CuVerro® Antimicrobial Copper Surfaces include: Healthcare Fixtures, Scrub Sinks, Sinks and Nurse's Hand Wash Stations. For more information, or to discuss custom specs, please contact Brian Smith at 847-678-5150. Just Manufacturing has been a leading manufacturer of hospital fixtures, providing health care products that help kill bacteria* which cause infection, while advancing safety and compliance. Since 1933, its stainless steel sinks and fixtures have been specified for hospitals and healthcare institutions worldwide. *Testing demonstrates effective antibacterial activity against Staphylococcus aureus, Enterobacter aerogenes, Methicillin-Resistant Staphylococcus aureus (MRSA), Escherichia coli O157:H7, and Pseudomonas aeruginosa. CuVerro® is a registered trademark of GBC Metals, LLC and is used with permission – J-0005-1202.